The X-1, ostensibly designed after the Bell X-1 hypersonic plane, uses Kailh Choc low-profile switches, a smart key layout, and some sleek engineering to make a full-sized mechanical keyboard that’s about the same size as the more stylish designs that ape Apple’s Magic Keyboard. 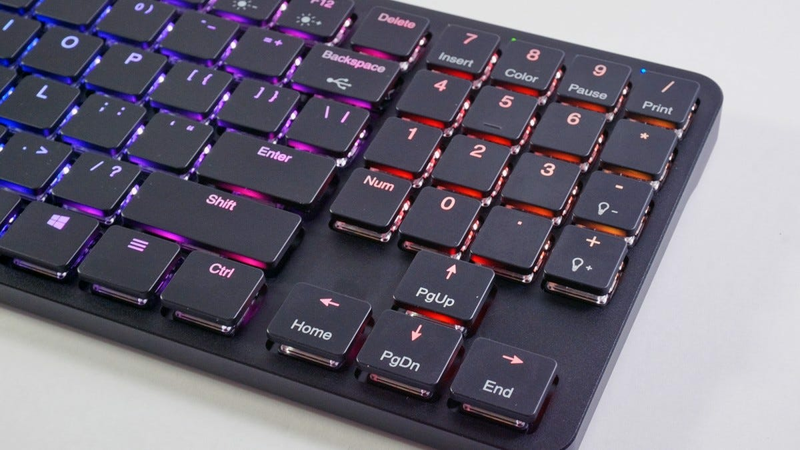 While it includes Bluetooth for hassle-free wireless, it also has a lagless USB-C connection with N-key rollover for the gamers among its target audience. 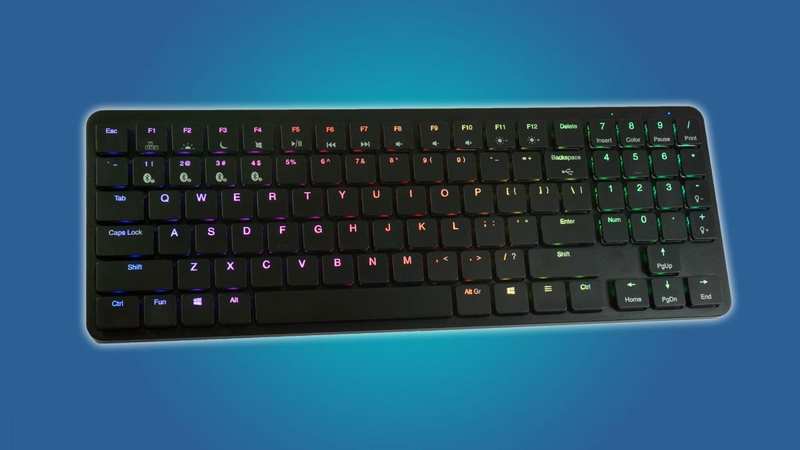 An aluminum casing, full RGB lighting, and a choice of two colors and three switches rounds out an impressive feature set, helping to justify the premium $120 price. 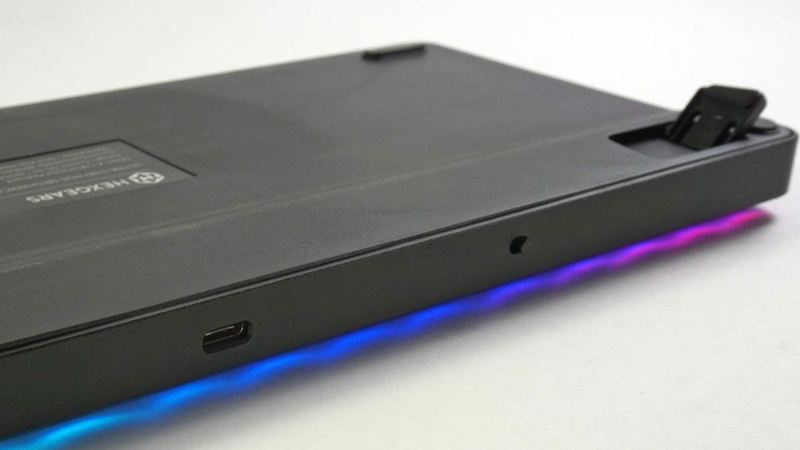 The X-1’s laptop-style chiclet keys won’t please everyone, and its battery life drops sharply if you turn on the lights. But those are the only major complaints I can lodge against this thing. It’s beautiful, it travels better than any other mechanical keyboard I’ve tried, its switches are shorter than I’m used to but that’s a more than acceptable compromise for its size and weight. 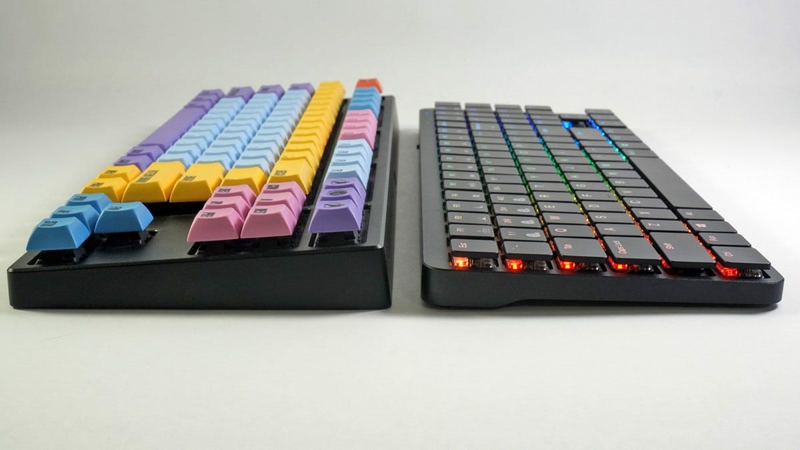 If you’ve been put off by the chunky looks and stodgy insistence on wired designs of most mechanical keyboards, this one might just make you a believer. Tastes in keyboard aesthetics are quite broad. If you find two users who actually care about how their keyboard looks (which is admittedly a small subset), you’re unlikely to find a common opinion between them. Even so, I’ve yet to hear anything except praise for the look of the Hexgears X-1. I ordered mine in black, to match the rest of my desk, but it also comes in grey aluminum with white keys if your taste leans towards Cupertino. The whole thing has around the same footprint as a tenkeyless keyboard, but it’s only three-quarters of an inch tall at its thickest point. I usually forego keyboard legs, but I was happy to use the small fold-out legs in the X-1 just to get a more familiar raised profile. 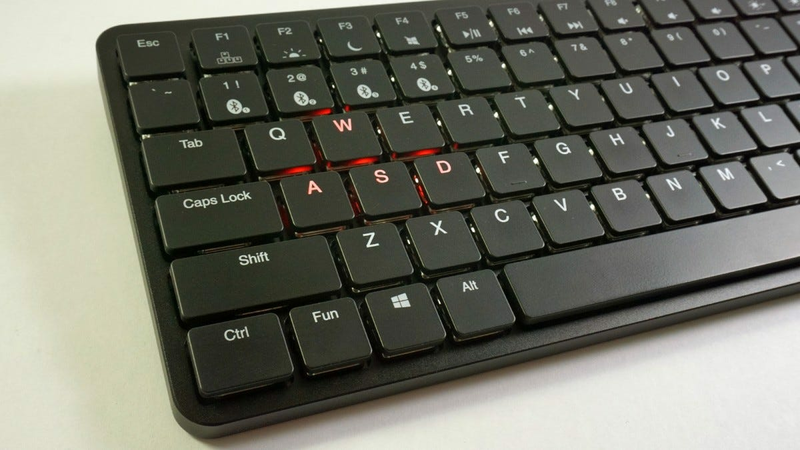 The flat chicklet keys use white printing that allows the RGB lights to come through as bright as any “gamer” keyboard, and the thin aluminum housing feels elegant and sharp. The aluminum wraps around the curved corners and sizes, only surrendering to plastic on the bottom face of the board, I suspect for the sake of weight and Bluetooth wireless signal. Turn on the lights, and this thing looks like something from a movie set: pristine, sparkling, and futuristic—and amazingly appealing for something so functional. In a keyboard world full of Jeeps and F-150s, the Hexgears X-1 is a Jaguar. Despite all the metal and switches, the keyboard weighs in at just 1.1 pounds (about half a kilogram). Compare that to 1.7 pounds for a full-sized plastic mechanical board, or 3.4 pounds for my ridiculous all-aluminum Varmilo. With a length of 14 inches, it won’t fit into the tiniest bags or even a mid-sized purse, but a messenger or laptop bag should be able to handle it easily. And that’s a good thing since the X-1 begs to go out. Its featherweight and slim build mean it’s easy to bring along for a trip to the coffee shop or a working weekend, where it will give you a better typing experience than just about any laptop. Combine it with a flexible mobile machine, like a back-bending convertible or a Surface tablet sans the keyboard cover, and it’s almost as good as having your trusty full-sized mechanical board at your desk. Between the slim build and the lightweight, I found myself much more likely to actually bring this thing along with me… I only wish I’d had it while I was carrying a massive, full-metal keyboard around on a three-week research trip earlier this year. To facilitate even easier travel, the Kono store includes a hard fabric case with every Hexgears X-1 purchase. It’s an attractive add-on and an appreciated bonus considering the price, but to keep it as thin as possible they put the USB-C cable keeper on the side, making it even longer. That will put it past what some laptop bags or even backpacks can handle. 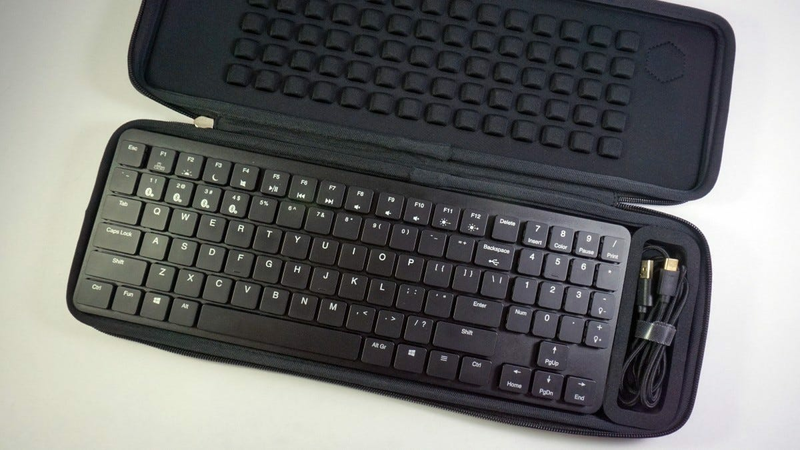 Something less appealing and more practical, like this neoprene case I ordered for my bigger keyboards, would have been better. Or even better yet, maybe forget the case and knock $10 off the price. I’m not a fan of RGB lighting myself, but if you are, the X-1 won’t leave you wanting. 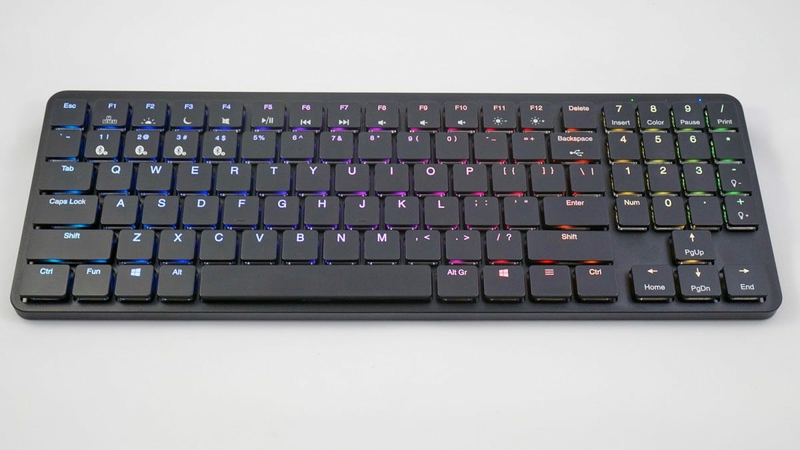 While the keyboard doesn’t offer the programmable splendor of the big gaming decks, it does offer the usual rainbow of full-color modes, four brightness settings, and a neat option that only illuminates the WASD and arrow keys. Each mode can be adjusted from full color through the ROY G. BIV spectrum, plus white. Note that, while the keyboard lasts for a week without any lighting, pumping the animations and brightness up can cut that down to just a few hours. If you’re a touch typist and you need longevity, go without the light show. If you’re looking for more customization options, you’ll be out of luck. Kailh’s low-profile key switches aren’t compatible with standard Cherry keycaps, so there are precious few alternatives available. Even if you wanted those rather sedate options, the compacted layout of the X-1 is non-standard, with four keys squeezed into just over three columns on the right side and an extra function button on the bottom row. So even if you could find caps for this board, you wouldn’t be able to get a set that matched it. It’s a good thing it’s so pretty on its own. The ABS plastic on my black unit seems to attract fingerprints quickly, but it can be wiped down and cleaned easily enough. The switch options are fairly limited, but they should cover most users. I ordered the “Brown” switch, which tries to ape the feel of the Cherry MX Brown: medium give, tactile bump, but no loud “click” mechanism. Choc Red (full linear, no click, like Cherry Reds) and Choc White (tactile and clicky, like Cherry Blues). The browns feel surprisingly stiff at first, much more firm than I would have expected from the 50-gram force rating. But they soon started to feel smoother, and I’m not sure whether it was just myself getting acclimated to it or the springs loosening after a bit of breaking in. Either way, I was soon typing at my full speed. I only wish the flat keycaps had a bit more texture to them, which might help alleviate the initial slipping. Let’s talk about this compact layout on the X-1. 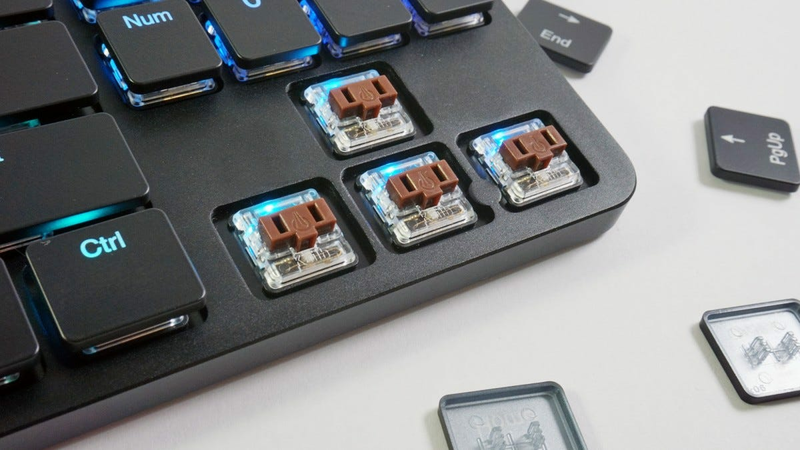 If you’re a die-hard 10-key user, you’ll appreciate the way that the right number pad has been integrated with the middle control cluster, allowing for almost all of the functions of a full-sized board in a tenkeyless size. Which isn’t to say that it’s perfect. Compacting all of those functions and getting rid of the margins of a regular board has a bit of fallout, particularly with the Delete key moved above Backspace. Users who demand physical Page Up and Page Down keys won’t like their function layer positions on the arrow keys, either. The keyboard can’t be reprogrammed in any way. But after a bit of adjustment, I was finding it easy enough to get into my regular workflow. Switching between my full-sized layout and this one did get a bit awkward—and that’s a legitimate concern if you’re planning on using the X-1 as a travel keyboard. If you intend it to be your primary text input, it’s less of an issue. I was looking for a more portable mechanical option for writing on the go. And having tried cheaper boards with Kailh’s low-profile Choc switches, I was expecting the Hexgears X-1 to be functional, if not outstanding. But I was surprised at how many features and how much functionality is crammed into this little board. The look of the keyboard is great—seriously, my pictures can’t do it justice—and its fit and finish entirely justify its high asking price. 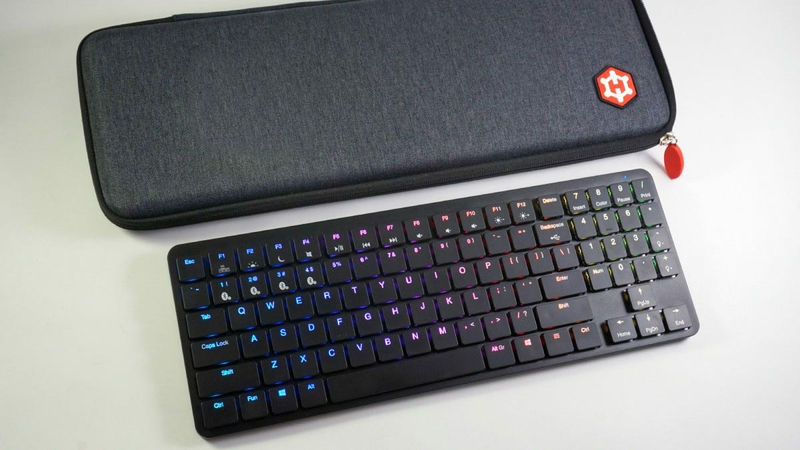 It’s the most easily-portable mechanical keyboard I’ve seen yet. It’s much more comfortable to use than even the best laptop keyboards, and good enough to tempt me to use it as my main desktop keyboard as well. With a wired USB-C option and red key switches, it even makes a pretty good gaming board. I wish the X-1 had longer battery life and perhaps a bit more texture to its keycaps, especially since finding replacements is all but impossible. And the included case, while nice, actually makes it considerably less portable. But as a premium option that gives users mechanical feel while being an excellent traveling companion, it’s unmatched in the current market. Be aware that actually tracking down one of these keyboards might be tricky. Stock is limited, so getting the precise color and switch combination you want may require some patience. Do you love the thrill of finding a good deal? Are you so in tune with discounts, bargains, and sweet, sweet savings that you find yourself sharing the deals you find with friends? Well then, we just might have a job for you.